The show of ‘Jannat’ film has been shut down in border district of Satkhira, which police said an effort to avoid possible violence following an allegation over of ‘hurting Muslims’ religious sentiment’ by the film. This was reported from ‘Sangeeta Cinema’ in the district’s Sadar Upazila on Friday (Sept 14). 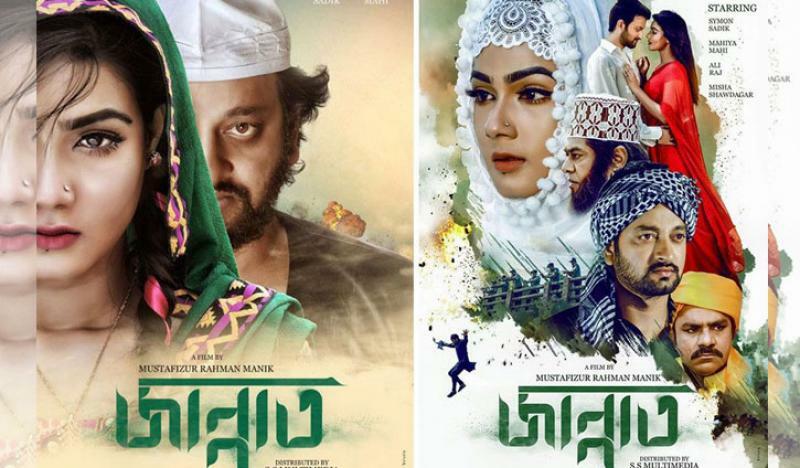 ”Show of ‘Jannat’ was scheduled to begin on Friday, the hall owner scrapped it after local administration order to do so,” Mostafizur Rahman Manik, director of the film, told Bangla Tribune. Prior to that, a group of ‘devotees’ brought out a protest procession alleging title and poster of the film go against Islam. The hall authorities also removed the film banner after the demonstration. Director Manik, however, was left stunted hearing the news. “I am surprised and disappointed. I’ve presented the glory of Islam in the film,” he said. “Islam is a religion of peace. And our life should be led according to the peaceful way of Islam that has been told in the film. “It’s really sad to stop the show without watching it and on the basis of assumption,” lamented Manik. Saymon and Mahi starrer ‘Jannat’ hit theatre in Eid-ul-Azha.